6x Savvies® SU75 Screen Protector for Nikon D3500. Savvies UltraClear Screen Protector for Nikon D3500: Crystal-Clear, easy application, excellent price quality ratio. The Savvies® SU75 UltraClear screen protectors are manufactured in Germany with the latest high-precision laser machinery. 6x Savvies® SU75 Screen Protector for Panasonic Lumix DC-FZ82. Savvies UltraClear Screen Protector for Panasonic Lumix DC-FZ82: Crystal-Clear, easy application, excellent price quality ratio. The Savvies® SU75 UltraClear screen protectors are manufactured in Germany with the latest high-precision laser machinery. 6x Savvies® SU75 Screen Protector for Canon EOS M50. Savvies UltraClear Screen Protector for Canon EOS M50: Crystal-Clear, easy application, excellent price quality ratio. The Savvies® SU75 UltraClear screen protectors are manufactured in Germany with the latest high-precision laser machinery. 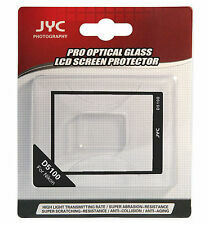 Screen Protectors for Nikon D3100 D3200 D3300 D3400 D3500. Note: The real color of the item may be slightly different from the pictures shown on website caused by many factors such as brightness of your monitor and light brightness. 2x BROTECT® HD-Clear Screen Protector for Panasonic Lumix DMC-TZ100EB. BROTECT® HD-Clear Screen Protector for Panasonic Lumix DMC-TZ100EB- Crystal-clear, hard-coated, anti-fingerprint, easily mountable and removable. 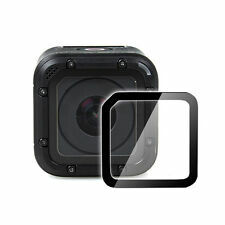 NEW Lens Screen Film Protector for GoPro Hero 5 6 7 Black Edition Hero 2018. 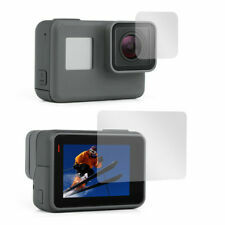 Compatible with:For GoPro Hero 5 6 7 Black and Hero 2018 Edition. 1 Screen Protector Film. 1 Lens Protector Film. Quantity: 2PCS (1PCS for Lens 1PCS for Screen). 6x Savvies® SU75 Screen Protector for Canon EOS M100. Savvies UltraClear Screen Protector for Canon EOS M100: Crystal-Clear, easy application, excellent price quality ratio. The Savvies® SU75 UltraClear screen protectors are manufactured in Germany with the latest high-precision laser machinery. 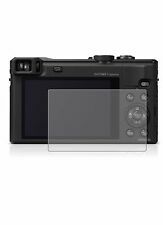 BROTECT® AirGlass® Glass Screen Protector for Panasonic Lumix DMC-GX80. BROTECT® AirGlass® Premium Glass Screen Protector, the Extra-Hard and Ultra-Light sidekick for your Panasonic Lumix DMC-GX80! Product Video BROTECT® AirGlass® Premium Glass Screen Protector - YouTube. The Savvies® SU75 UltraClear screen protectors are manufactured in Germany with the latest high-precision laser machinery. This screen protector preserves the original touch experience of your device. 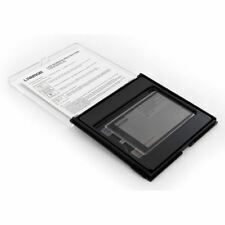 6x Savvies® SU75 Screen Protector for Panasonic Lumix DMC-TZ100. Savvies UltraClear Screen Protector for Panasonic Lumix DMC-TZ100: Crystal-Clear, easy application, excellent price quality ratio. The Savvies® SU75 UltraClear screen protectors are manufactured in Germany with the latest high-precision laser machinery. 6x Savvies® SU75 Screen Protector for Insta360 One X. Savvies UltraClear Screen Protector for Insta360 One X: Crystal-Clear, easy application, excellent price quality ratio. 6x Savvies® SU75 Screen Protector for Insta360 One X (6x Display). 6x Savvies® SU75 Screen Protector for Canon EOS 2000D. Savvies UltraClear Screen Protector for Canon EOS 2000D: Crystal-Clear, easy application, excellent price quality ratio. The Savvies® SU75 UltraClear screen protectors are manufactured in Germany with the latest high-precision laser machinery. Compatible model: for Nikon D750. After special strengthening process, the surface strength can reach or close to 8H, which can effectively prevent the LCD display from grinding and scraping. Not affected by normal high and low temperature and humidity, the normal use will not fall off, will not produce bubbles, warping angle, do not need to replace. Compatible with Sony ALPHA A7II A7rII A7sII A7III A7RIII. Sony ALPHA A7II A7rII A7sII A7III A7RIII. Exclusive for SONY Alpha A7II A7rII A7sII A7III A7RIII. Wearable & Durable - Inherent to its unique material properties, our screen protectors are much more wearable and durable. 2x BROTECT® Matte Screen Protector for Panasonic Lumix DMC-GX80. 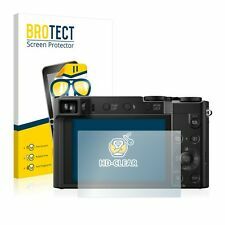 BROTECT® Matte Screen Protector for Panasonic Lumix DMC-GX80- Matte and anti-glare, anti-scratch, anti-fingerprint, easy to apply and residue-free removable. 6x Savvies® SU75 Screen Protector for Nikon Coolpix B500. Savvies UltraClear Screen Protector for Nikon Coolpix B500: Crystal-Clear, easy application, excellent price quality ratio. The Savvies® SU75 UltraClear screen protectors are manufactured in Germany with the latest high-precision laser machinery. 6x Savvies® SU75 Screen Protector for Olympus OM-D E-M5 Mark II. Savvies UltraClear Screen Protector for Olympus OM-D E-M5 Mark II: Crystal-Clear, easy application, excellent price quality ratio. The Savvies® SU75 UltraClear screen protectors are manufactured in Germany with the latest high-precision laser machinery. 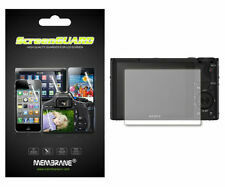 This screen protector film is specially designed for Nikon D3200 D3300 D3400. 2 Screen Protector Films for Nikon D3200 D3300 D3400. The film is coated on the back with a strong silicone adhesive which makes it firmly attach to the screen and won't reduce the sensitivity of touching. Product Video BROTECT® AirGlass® Premium Glass Screen Protector - YouTube. P.S. : Our sidekick BRO is made of real glass and still flexible! See for yourself: Twist the piece of AirGlass® remaining on the release film. 2x BROTECT® Matte Screen Protector for Canon EOS 750D. BROTECT® Matte Screen Protector for Canon EOS 750D- Matte and anti-glare, anti-scratch, anti-fingerprint, easy to apply and residue-free removable. Color: Transparent(as pictures show). This hard screen film can effectively protect the screen from scratches. 2, The real color of the item may be slightly different from the pictures shown on website caused by many factors such as brightness of your monitor and light brightness. 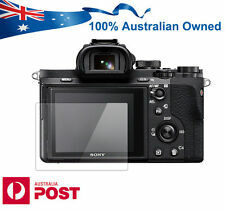 BROTECT® AirGlass® Glass Screen Protector for Panasonic Lumix DC-G9. BROTECT® AirGlass® Premium Glass Screen Protector, the Extra-Hard and Ultra-Light sidekick for your Panasonic Lumix DC-G9! Product Video BROTECT® AirGlass® Premium Glass Screen Protector - YouTube. Color: Transparent(as pictures show). This hard screen film can effectively protect the screen from scratches. Prevents fingerprints and other contaminants and makes the film easy to clean. 2, The real color of the item may be slightly different from the pictures shown on website caused by many factors such as brightness of your monitor and light brightness. BROTECT® AirGlass® Glass Screen Protector for Nikon D7500. BROTECT® AirGlass® Premium Glass Screen Protector, the Extra-Hard and Ultra-Light sidekick for your Nikon D7500! Product Video BROTECT® AirGlass® Premium Glass Screen Protector - YouTube. SLR LCD Screen Protective Cover for Nikon D800 D800E D810. Suitable for: For Nikon D800 D800E D810. 1 Screen Protective Cover. Note: The real color of the item may be slightly different from the pictures shown on website caused by many factors such as brightness of your monitor and light brightness. 6x Savvies® SU75 Screen Protector for Canon EOS R. Savvies UltraClear Screen Protector for Canon EOS R: Crystal-Clear, easy application, excellent price quality ratio. The Savvies® SU75 UltraClear screen protectors are manufactured in Germany with the latest high-precision laser machinery. 2x Tempered Glass Screen Protector for Sony Alpha A7II A7III A7SII A7RII A99 A9. Strictly tailored to fit each screen perfectly. Note: The real color of the item may be slightly different from the pictures shown on website caused by many factors such as brightness of your monitor and light brightness. For Sony A7 II. For Sony A7 III. For Sony A7S II. For Sony A7R II. For Sony A77 II. For Sony A99. For Sony A9. Strictly tailored to fit each screen perfectly. 6x Savvies® SU75 Screen Protector for Canon EOS 750D. Savvies UltraClear Screen Protector for Canon EOS 750D: Crystal-Clear, easy application, excellent price quality ratio. The Savvies® SU75 UltraClear screen protectors are manufactured in Germany with the latest high-precision laser machinery. 6x Savvies® SU75 Screen Protector for Nikon D5100. Savvies UltraClear Screen Protector for Nikon D5100: Crystal-Clear, easy application, excellent price quality ratio. The Savvies® SU75 UltraClear screen protectors are manufactured in Germany with the latest high-precision laser machinery. 6x Savvies® SU75 Screen Protector for Canon EOS 6D. Savvies UltraClear Screen Protector for Canon EOS 6D: Crystal-Clear, easy application, excellent price quality ratio. The Savvies® SU75 UltraClear screen protectors are manufactured in Germany with the latest high-precision laser machinery. 2x BROTECT® HD-Clear Screen Protector for Nikon Z 6. BROTECT® HD-Clear Screen Protector for Nikon Z 6- Crystal-clear, hard-coated, anti-fingerprint, easily mountable and removable. 2x BROTECT® HD-Clear Screen Protector for Nikon Z 6 (2x Display). 6x Savvies® SU75 Screen Protector for Sony Cyber-Shot DSC-HX80. Savvies UltraClear Screen Protector for Sony Cyber-Shot DSC-HX80: Crystal-Clear, easy application, excellent price quality ratio. The Savvies® SU75 UltraClear screen protectors are manufactured in Germany with the latest high-precision laser machinery. The Savvies® SU75 UltraClear screen protectors are manufactured in Germany with the latest high-precision laser machinery. Attach screen protectors without bubbles of air - protectionfilms24 - YouTube. Compatible with:For - Fujifilm X-T3. Material:Tempered Glass (Anti-Scratch, Anti-Dust). The protector's silicone gel layer allows it to cling securely to your screen without leaving a sticky residue behind. For Nikon D3200, D3300, D3400, D3500. JJC Guard Film has a high transmission up to 92%, in this way to preserve screen clarity. A special silicon adhesive makes for easy application and removal without leaving sticky residue. For Sony A7R II. Hardness up to 9H. For Sony A9. For Sony A7 II. For Sony A7S II. For Sony A77 II. For Sony A7 III. For Sony A99. For Nikon D7100, D7200. 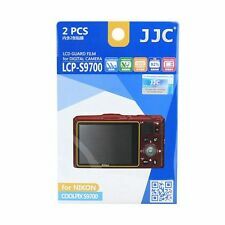 1 x JJC LCP-D7100, D7200 LCD Screen Protector Film. JJC Guard Film has a high transmission up to 92%, in this way to preserve screen clarity. A special silicone adhesive makes for easy application and removal without leaving a sticky residue. Sony a9, a7S II, a7R II, A7II, a7R III, a7 III, a7S III. The film anti-reflection coating reduces annoying surface glare under bright lights. The hard coating on the film avoids scratching by hard objects. 6x Savvies® SU75 Screen Protector for Canon EOS 4000D. 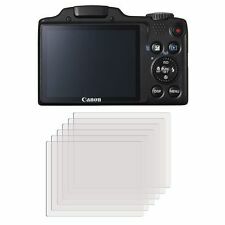 Savvies UltraClear Screen Protector for Canon EOS 4000D: Crystal-Clear, easy application, excellent price quality ratio. The Savvies® SU75 UltraClear screen protectors are manufactured in Germany with the latest high-precision laser machinery. JJC Guard Film has a high transmission up to 92%, in this way to preserve screen clarity. A special silicon adhesive makes for easy application and removal without leaving sticky residue. 1 x JJC LCP-XT1 LCD Screen Protector Film. For Canon EOS 1200D, 1300D, 1500D, 2000D. JJC Guard Film has a high transmission up to 92%, in this way to preserve screen clarity. A special silicon adhesive makes for easy application and removal without leaving sticky residue. The film anti-reflection coating reduces annoying surface glare under bright lights. The hard coating on the film avoids scratching with hard objects. The unique anti-smudge coating reduces fingerprints and facilitates cleaning. Note: TheProtector is not produced by Fujifilm. HIGH DEFINITION: Made of the optical glass material, which achieves more than 99% of transmittance, higher than plastic screen protectors. Exceptionally clear & low reflection. Compatible with Sony ALPHA A7 III A7r III A7II A7rII A7sII. N ot fit the A7 A7r A7s Mark I. Does not fit the A7 A7r A7s Mark I. Wearable & Durable - Inherent to its unique material properties, our screen protectors are much more wearable and durable. JJC Guard Film has a high transmission up to 92%, in this way to preserve screen clarity. A special silicone adhesive makes for easy application and removal without leaving a sticky residue. The removable protective fronting and backing with stickers on provide you an easy installation. Sony Alpha A9 A7III A7II Cyber-shot RX100 RX100 II RX100 III RX1 RX1R RX10. Exclusive for SONY A7-Mark2 RX100 RX1 RX10. Wearable & Durable - Inherent to its unique material properties, our screen protectors are much more wearable and durable. Compatible With: For Sony RX100 IV III II RX1 RX1R M4. Its tempered glass prevents the glass from shattering. 1 x LCD Screen Protector Guard. The glass also blocks UV rays while allowing visible light in.